^^Her face in this photo….I die! hahahaha! 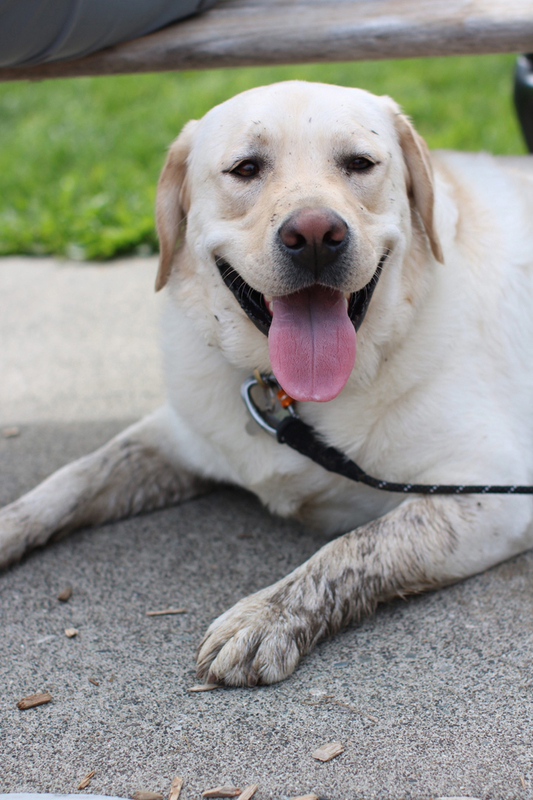 ^^A successful day at the park chasing tennis balls with new furry friends. He was exhausted by the end of the day. ^^Cutest thing I’ve ever seen! Love them!! ^^She’s in the phase where all she wants to do is crawl on the ground. Help! It’s so dirty but she insists. Today I’m sharing a few pics from our time in Washington. We stayed in Bellingham and stumbled across this gorgeous park. Dash was in dog heaven (he made lots of new friends) and miss Isla Rose had the time of her life on the swings. It was hilarious watching her face while her dada pushed her! p.s. I’ll be announcing the giveaway winners later today so stay tuned!!! Isla is so adorable!!! That 6-tooth smile is so precious! Her “Hi” on Snapchat is soooo cute. Red is a gorgeous color on you! Looks like you had a great trip to Washington! Thanks so much Lexa!!! It has been a little different this time around with Isla but we are just so excited :) I bet you are the best mom!!! I will be announcing the winners soon! These shots are adorable! Can’t wait to see little Isla be a big sister! I can’t wait either!!! She will be the best big sister :) Thanks for commenting Pam! Enough of those boots! Love them!! You make such a lovely family! Your comments are seriously some of my favorite to read!!!! Thanks Sasha! Looks like it was a fun family time at the park! Love your booties!! And red is gorgeous on you! What a photogenic family! I just love watching the pure joy of kids faces on the swings. :) My kids were always the same about crawling! Oh my gosh she LOVED the swings! I can’t wait to take her back! Such a cute post!!! Beautiful photos. Such a adorable photos!!! You’re looking gorgeous top to bottom! Isla is having so much fun! Lovely pics! Gorgeous! Love all of the pics of you and your fam! Hahaha I really should’ve!!! haha Thanks Andreea! Such sweet photos! Glad you enjoyed some time away with your family. Love your dress! I love that Isla’s bow and shoes match your dress, so fun and cute! I love reading your comments Mia!! You are so sweet and always have the nicest things to say. What a cute post!! Your baby girl is so cute. We’ve definitely been enjoying the parks here with the warmer weather. Love your dress!! Such sweet photos! 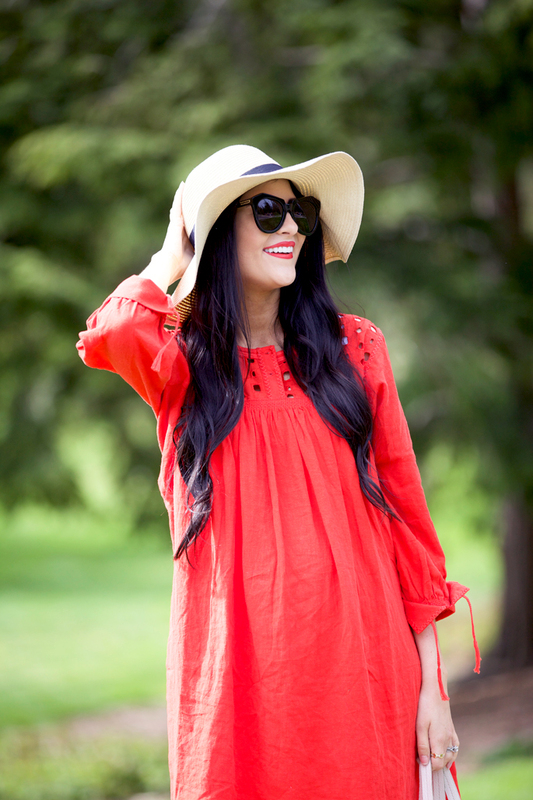 Love that bold red dress. And your little girl has the perfect amount of baby pudge! SO CUTE. Thanks :) She had so much fun!! So stinkin cute!! I love her face on the swing! I wish we had a park close by to push my little one in!! She loves it. So glad you got to make a road trip to see the tulips. I’m lucky enough to be close by (Seattle) and the eye candy of those fields in full bloom just never gets old. This year was particularly glorious after a wetter than normal, but warm, winter. So thrilled to hear about your growing family. Although old enough to be your mother (yikes!) I follow a lot of bloggers in my work for a major fashion retailer and and adore fashion/lifestyle blogging myself. Also, as the mother of two fashionista millennials, it seems my destiny to follow fashion! Thank you so much Anne!! The tulips were literally breathtaking… so worth the drive! You are just a joy to follow along!! Thanks for sharing your life with us. Love that dress!!!! 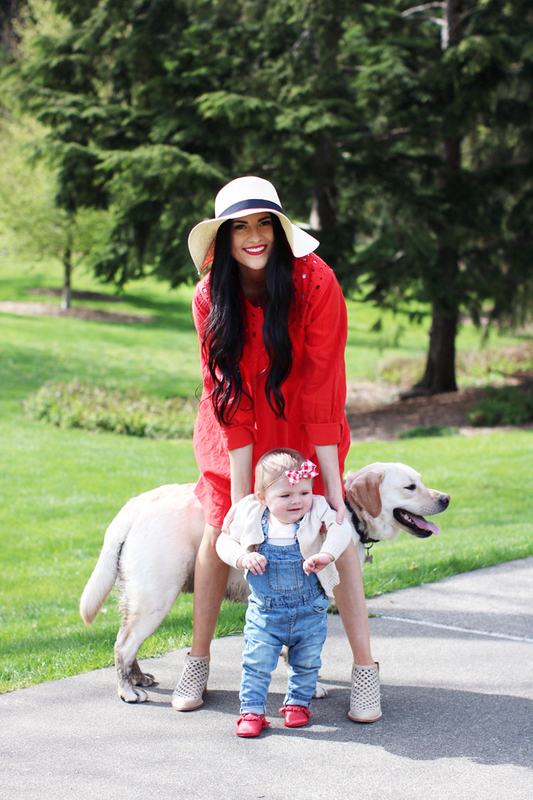 Love the hat and booties! The face Isla is making is soooooo funny! I love how you balance your job with ample family time as well! It is such a great example of how women can pursue a career and still be good mamas and wifeys! Thank you Brooke! It isn’t always easy but family is the most important thing to me so I’m glad that comes across :) thanks for following along! SO cute! I love see the more causal, family style photos!! You look gorg! Love the dress and the booties! Such a cute outfit. Isla is such a beauty! That smile is precious! Love those booties! Really like your pregnancy style this time around! Don’t feel like you’ve got to cradle the bump to try to show you’re pregnant. You don’t look fat, you look pregnant and great! your baby is adorable and you look gorgeous! Love the dress! So beautiful. Idea is adorable! Can’t wait for Monday!! Can’t wait to see who won they giveaway! BTW, I’m obsessed with those booties! totally need them. Beautiful pictures! You captured her so well on the swing! Just love it!! Aw little Dash is so happy! He loves his family! Love your blog! Happily following your new Instagram! Did all the steps! I bet the collection is beautiful! Isla is just letting cuter and cuter! And I love your outfit, it looks stylish, but comfy and practical too! Love this look, you look so gorgeous! 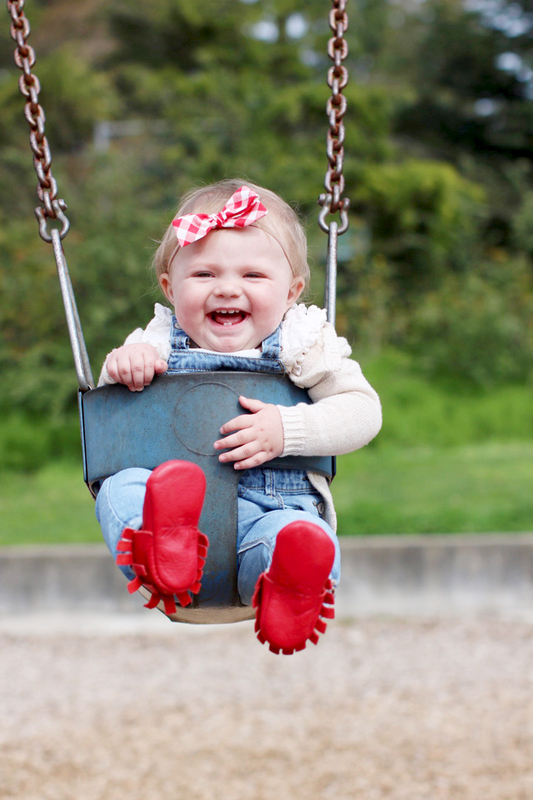 Miss Isla is too adorable in these pictures, her darling bows and cute little shoes get me every time! Love the color of that dress! And those shoes are amazing! Such a beautiful family Rachel. 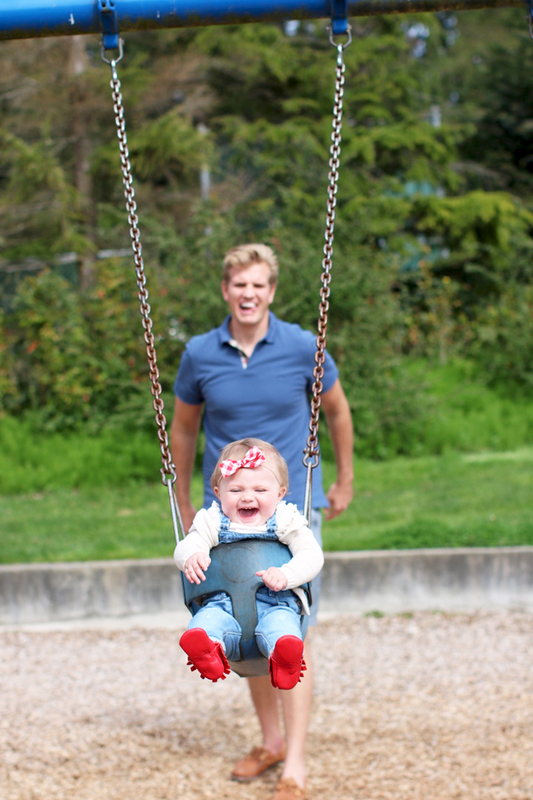 I love this so much, Isla Rose is so freaking cute, her on the swing is the sweetest thing ! I can’t believe your pregnant again, so amazing and so quick ! You look like an amazing mom though so I’m excited for you to have another one ! Such a lovely family ! P.s. Red looks amazing on you ! Like, soooo good ! Thanks for such a sweet comment Jess!!! Did all the steps! I’msure the collection will be beautiful! Congrats on your new line. I followed all the steps and hope I wine. Would be so awesome to win, please pick me! Lovely look. Your daughter is adorable and the park looks to be a fantastic place. 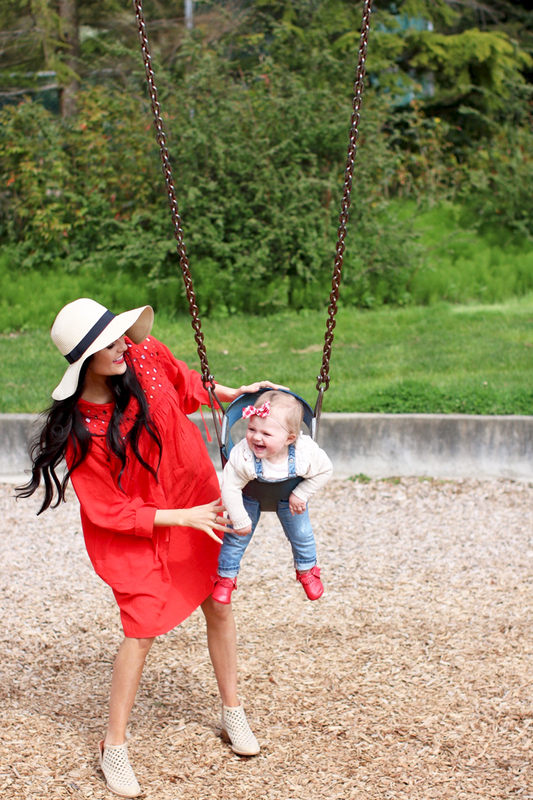 These are just three reasons to love everything about Rachel Parcell. You are an inspiration to young women around the world! Such a nice comment!!!! Seriously, thanks Nicole :) You are the best! Love these photos! 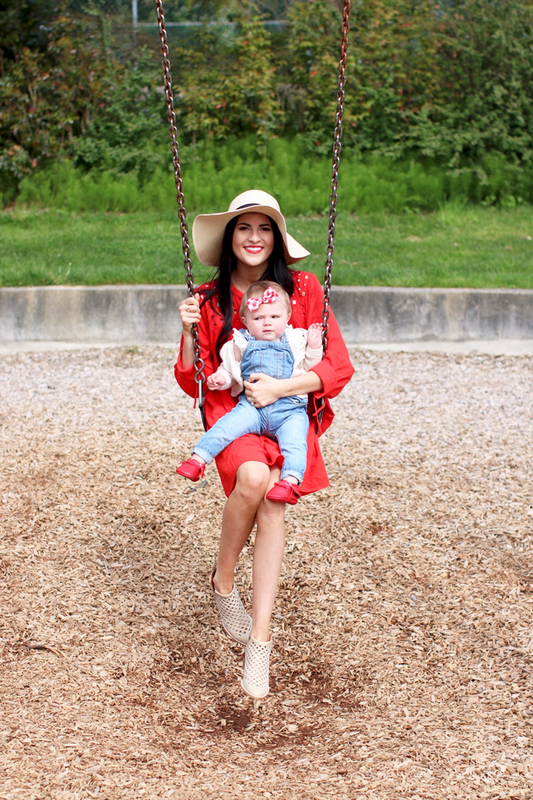 Isla looks so gorgeous & I absolutely adore your red dress – perfect for a day in the park! The dress is such a pretty color and goes perfectly with your skin color <3 Your little girl is the cutest! I loved the photo of her whenever she was making the silly face. I hope you have a wonderful Monday! What a cute family! I love Isla’s bow! !